The holidays are a super busy time, especially for moms who have kids home on winter break or out-of-town guests. Our winter break kicked off last Friday afternoon and now I have all three kiddos home all day every day plus my husband will be taking some days off work later this week. I am so excited for the break from schedules and school but overwhelmed with the amount of empty days we have to fill too. 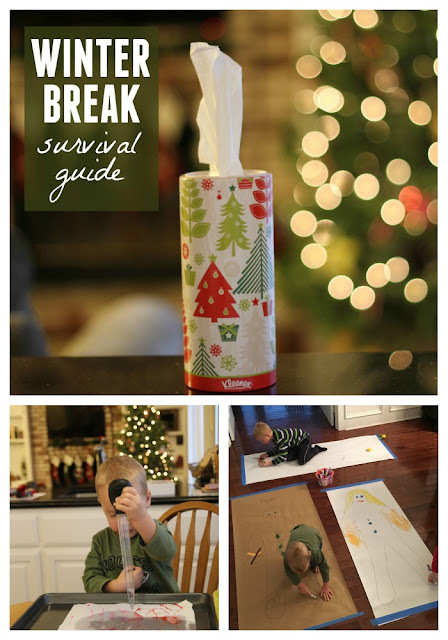 In order to enjoy our break together and have fun without driving myself crazy I have created a little winter break survival guide for our family. Here are six of my winter break survival guide necessities. I'd love to hear yours too! 1. Have a few structured activities planned each day to pull out if needed. One of the main reasons that I love winter break is because we all get to relax and take a break from the usual responsibilities like school and classes. I love to let my kids have loads of free time and have them fill that time however they want. They are usually great at finding games to play with one another or building forts or creating imaginative little worlds. Occasionally though everyone gets bored or starts fighting and that is why I like to have a repertoire of activities to pull out. Several of my favorite activities were featured in my recent boredom busters indoor activities post. 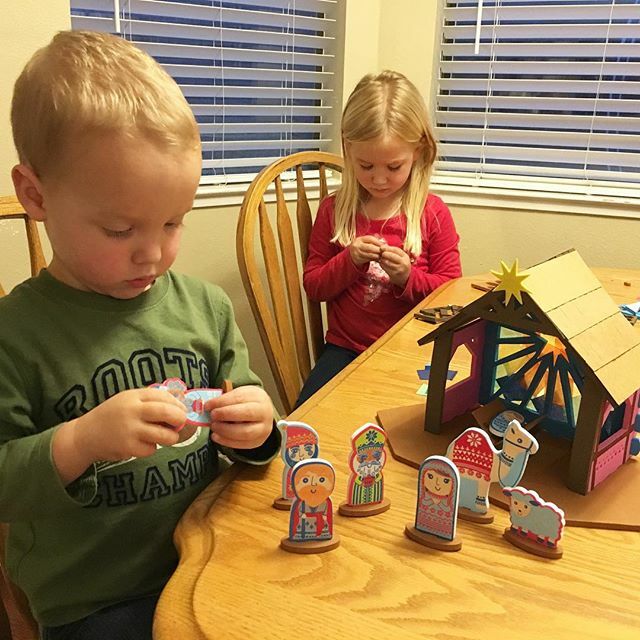 I love to find inexpensive foam craft kits to put together (like this foam nativity we made yesterday). We also love simple open ended crafting activities like making ourselves into giant gingerbread men. 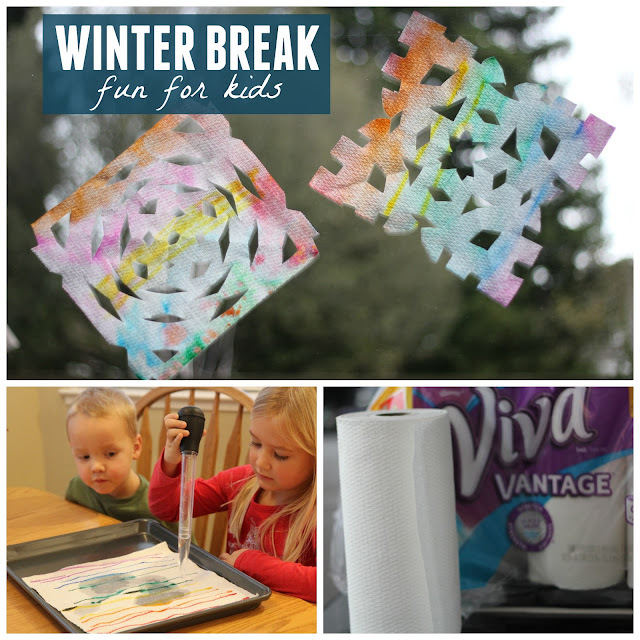 Another fun activity we're trying for winter break is using Viva® Paper Towels to make colorful snowflakes. First you color the paper towels with markers. Since they are Choose-a-sheet paper towels you can decide how big you want them to be and make small ones or big ones. Next you squirt them with water using a turkey baster. Then you let the colorful paper towels dry (after the color spreads). Finally you fold up the paper towels and cut them into beautiful snowflakes. They are gorgeous! 2. Stock up on critical supplies. With all three of my kids home I really have no desire to go shopping with everyone. Before winter break I tried to stock up on all of the essentials that I would need while the kids were home. My toddler and I headed to Walmart last week to pick up our favorite Cottonelle, Kleenex, Scott and Viva products. Walmart is always an awesome one-stop shop for all of my holiday preparation and entertaining needs. The employees were so helpful as we tried to locate different products and make sure we got the right things. One of my favorite products we picked up were the Kleenex® Perfect Fit* Facial Tissue canisters. I have loved using them as I've gotten ready for special events and they look so cute hanging out on my kitchen countertop. The unique size and adorable designs make them great to have out during parties to wipe up a quick mess or clean up kid's faces. 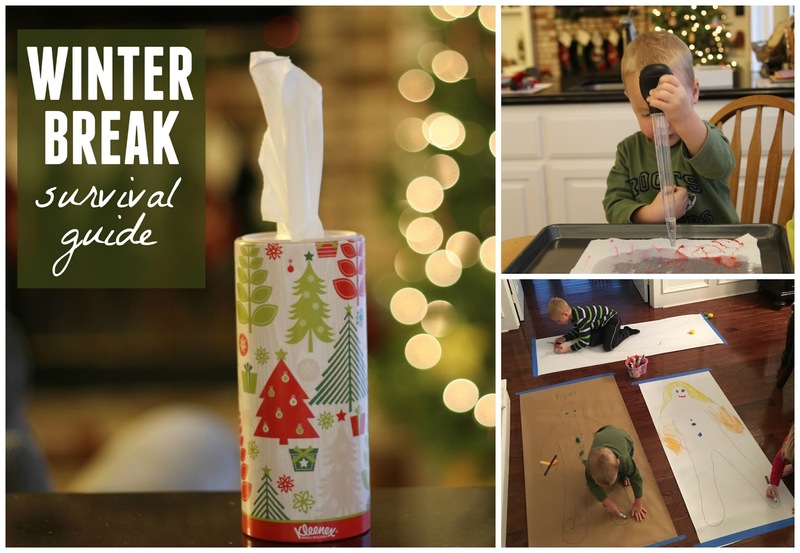 With all of the crafting we do during winter break we also stocked up on Viva® Paper Towels to help us keep our messes under control. Since they are so durable even my kids can help tackle messy jobs around the the house. 3. Plan meals and snacks out ahead of time. Everyone seems to be constantly hungry during winter break... even more so than normal. I have set up a snack cupboard and fridge drawer area with snacks I am OK having kids get for themselves and I'm trying to keep all of the treats and holiday goodies put away and inaccessible. Having access to healthy and hearty snacks tends to keep everyone a bit happier during break. I also try and keep meal times consistent and have them planned out so that I don't have a mad rush with everyone complaining they are hungry while I am frantically trying to figure out what to make. We have a few standard meals we rotate through each week so that makes things easy as well! It has been pouring here so far this week so we've been playing a bit in the rain but we also have been trying to make sure we have at least one excursion out of the house every day so that we don't go stir crazy. Some favorite inexpensive things to do include going to the library, walking around the mall and going up and down the elevator, and visiting local science centers. When the rain clears up we plan to spend some time hiking and visiting local parks along with riding bikes and playing on our trampoline. We just bundle up extra warm if it is cold! 5. Schedule in down time. Each day during winter break we schedule in afternoon quiet time for everyone- big kids and little kids... and me! Most days the kids take a break to play in their rooms for an hour and sometimes they get to have movie time all together. The goal is for us all to relax and get some down time. Everyone comes back from quiet time happier and energized. 6. Have a clean up plan. Although it is winter break and I try and keep things fun, we do have specific chore expectations for the kids every day, just like normal. When everyone is home we have specific people assigned for setting the table for meals and then everyone has to clear their own plate. Over vacation I also make sure that whoever makes dinner (usually ME!) doesn't end up with dish duty too. :) I like to assign my husband and one or two of the kids and we rotate it around. They love working together and I love a break after dinner. After dinner when everyone is energized we usually have room clean up time. Kids use their clean up checklists and we turn on music and everyone gets their room tidy. Afterwards we have a fun family activity together and sometimes a treat. I love that my kids have started helping each other get their rooms cleaned so that we can have a longer family activity time. I love winter break and these necessities have really helped us all enjoy it more. I'd love to hear what your winter break survival guide looks like. Tell me about it in the comments! Do you travel for winter break? Stay home? What fun stuff do you have planned? Stocking up before break is a great idea. It's so much easy to go shopping with only my toddler. That Kleenex container is so cute!